Ballito on the North Coast of Kwa-Zulu Natal. Find out about Ballito with trending events & activities, food, businesses, shopping & services. Ballito on the North Coast of KwaZulu-Natal. A little bit more about Ballito and the other areas on the North Coast of KwaZulu-Natal. Ballito, affectionately known as the Dolphin Coast, is a vibrant seaside town on the North Coast of Kwa-Zulu Natal. Ballito is in close proximity to Durban's King Shaka International Airport to the south, and many beautiful beaches including Westbrook Beach, Thompson's Bay, Chakas Rock, Salt Rock, Sheffield Beach and Umhlali as well as Tinley Manor, Blythedale Beach Stanger and Zinkwazi Beach to the north. Ballito is flanked by the warm Indian Ocean to the east and some of the most spectacular green rolling hills and farm lands to the west. Opportunities offered to Ballito's visitors and holiday makers are exciting and diverse. If you're looking for adventure, there are many enchanting locations within easy reach, or you may choose to simply relax on the warm sandy beaches and soak up the sun. With the North Coast's many bustling retail centres, sumptuous restaurants, fabulous beaches, breathtaking fairways, exhilarating cycle / running trails, wonderful wedding and conference venues, there is so much to enjoy, whether you're a Ballito local, or visiting from afar. Living on the Dolphin Coast is a dream for many, and as our beloved home-town grows and expands, we see more and more people choosing to holiday, retire, or even buy a second home here. The North Coast has seen a definite increase in families moving into the are and this generation mix gives the town it's distinctly all-round "village" charm which sets it apart from most seaboard resort towns. • Some highlights of life in Ballito. 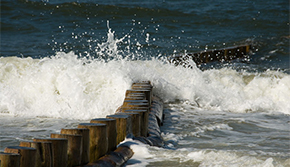 • Durban's King Shaka International Airport is only 12 minutes away. • World class hospitals in close proximity offering specialist care. 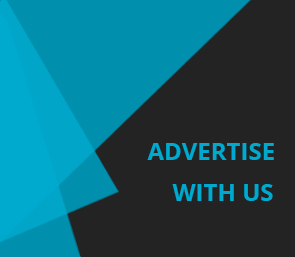 • Excellent local schools offering a variety of different curricula. • Scenic mountain bike and running trails. 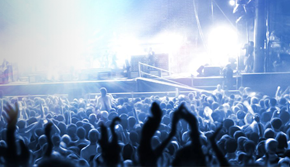 • Fantastic shopping and entertainment facilities. (Lifestyle Shopping Centre, Tiffany's Shopping Centre and the new Ballito Junction Regional Mall). 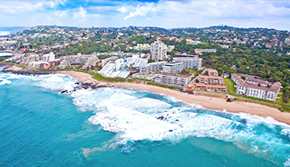 Ballito's spectacular bathing beaches are a popular attraction along the Dolphin Coast. They are protected by shark nets or bait drums which are checked daily by the Natal Sharks Board. Qualified life-guards are on duty to ensure bathers' safety seven days a week. Surfing & body boarding are popular activities at Salmon Bay, Clark Bay, Willard's Main Beach, Thompson Bay, Salt Rock and Tiffany’s Beach as they are renowned to offer great wave action. 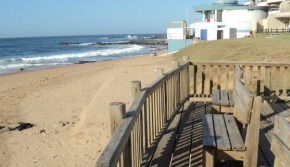 For those that want to stroll and enjoy the sea views and other beach activities, there is the very popular 2.6km long Ballito promenade of snaking along the coastline from Willards Beach to Salmon Bay. One could cool down in the refreshing Clark Bay tidal pool. Willard Beach is Ballito's main bathing and surfing beach and home to the world-famous Ballito Pro surfing festival presented by Billabong, held each year in June and July. Lifeguards are on duty during normal beach-going hours and there are shark nets installed and serviced by the Natal Sharks Board to protect bathers and surfers. The upmarket town of Ballito is thriving with the developments of Simbithi Eco-Estate, Zimbali Estate, Dunkirk, Brettenwood, and many other residential secured estate-style living investments. With land becoming increasingly scarce in surrounding areas and the King Shaka airport and Dube Tradeport less than 12 minutes away along the N2 between Verulam and Tongaat, the latest property 'hot-spot' is right here on the Dolphin Coast. There are many breathtaking areas to choose from, whether you're looking for property on the beach or inland. For more information about acquiring your piece of Ballito or the surrounding areas, contact one of the many real estate agents in town. 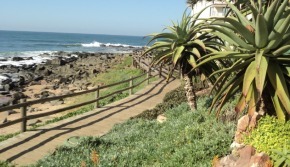 This is the very popular and scenic Ballito promenade snaking along the beach front for 2.6km from Willard Beach to Salmon Bay. From early morning to late evening, you will find locals and visitors strolling, walking or running along this pathway, or simply taking in the scenery by watching others enjoy their beach-front activities. There is also a good chance of seeing a school of dolphins surfing in the waves or a whale or two in the deeper water off backline and if things get a little warm, one could take a dip in the Clarke Bay tidal pool.